Rovio is hoping that its next game will help slingshot the company to new heights. Angry Birds has had an impressive run since its release in 2009, netting developer Rovio more than $100 million in sales revenue. 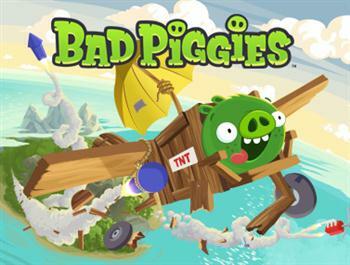 The company's subsequent releases, however, weren't runaway hits like Angry Birds, and analysts say that Bad Piggies needs to be just as successful in order to maintain Rovio's success. Amazing Alex, the company's first non-Angry Birds game in more than two years, reached #1 on the download charts in July, but has since fallen outside the top 50. Angry Birds Space is also falling from top grossing lists. Angry Birds, by comparison, has served over a billion downloads, with 200 million monthly users at the end of 2011. Finnish mobile analyst Tero Kuittinen says that Rovio needs another big hit like Angry Birds to keep its momentum. "Over the past two months, Rovio's revenue-generation ability has suddenly slipped badly," he says. "There is no doubt that the pig game will hit number 1 at launch. But it has to stay in top ten for half a year to erase the doubts that the fast fade of Amazing Alex has created. "Rovio needs to re-establish its reputation for creating hits with legs." Petri Jarvilehto, Rovio's head of gaming, calls Bad Piggies a "long term branding exercise". His hope is to see both Angry Birds and Bad Piggies established as strong, vibrant brands over the next three years, bolstered by both app downloads and merchandising in the form of stuffed animals, toys, and even branded playground equipment. Bad Piggies and Bad Piggies HD are currently sitting at #1 and #2 on the iTunes charts respectively.